At the Toronto District School Board, keeping our students safe is central to all our policies and procedures. We take every precaution to minimize the risk of preventable accident or injury and ensure safe learning environments. But accidents can happen. When they do, injuries may involve medical, dental or other expenses that are not covered by provincial health care or employer group plans. Parents/Guardians may be surprised to find they must pay the cost of crutches, casts, splints or ambulance rides. The TDSB does not provide accident insurance coverage for student injuries that occur on school premises or during school sponsored activities. As a Parent/Guardian, you are responsible for such expenses, which may result in financial hardship. To take the worry out of unexpected costs, Parents/Guardians may purchase coverage under an affordable Student Accident Insurance Policy. Participation is voluntary but highly recommended. Choose from a variety of plans and benefits, each with only a single, one-time annual premium per student. To learn more, pick up a brochure at your elementary school office, or read our letter to Parents/Guardians. 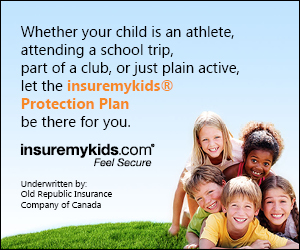 Call the toll free number at 1-800-463-KIDS (5437), or visit insuremykids.com.